No single country or individual could put an end to illegal wildlife trade, but joint international efforts should be made to prevent wildlife crimes and protect the elephant species in the centuries ahead, US Ambassador to Vietnam, Ted Osius, has said. 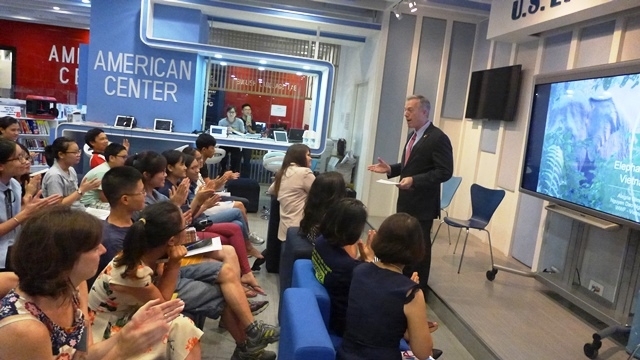 The diplomat made the statement while addressing a talk held by the US Embassy in Hanoi, on August 11, in response to World Elephant day (August 12), under the theme “Please treat elephants well”. In attendance at the event were Nguyen Dao Ngoc Van and Alegria Olmedo from the World Wildlife Fund (WWF), Rose Indenbaum from TRAFFIC, and Nguyen Thi Phuong Dung from Education for Nature Vietnam (ENV). During the talk, delegates called for greater attention to elephants and their difficult living conditions, whilst discussing possible ways to preserve the last 100 wild elephants that remain in Vietnam. The event enabled participants to understand more about the ways in which they could tackle the threats to elephants, through voluntarily joining wildlife organisations, supporting wildlife preservation efforts and raising awareness of the elephants’ struggle for survival. Earlier on August 10, the US Embassy screened a film entitled “Ivory Game”, a documentary film featuring illegal elephant ivory trade, from the moment the elephant was poached in Africa to the moment when the elephant ivories were sold illegally in Asia.